Well its fifteen years today that all of this began. There's so much to look back upon but really the main thing is that there has yet to be an independent investigation into the bombing. Who ordered it? and why? These are questions which haunt the people left behind and to this date those questions have yet to be answered. Its fifteen years today. To be sure, Lockerbie still grabs the headlines but for most its a terrible event in history best forgotten. Still looking at the headlines from around the world, I am happy (?) (such a weird word to use for describing what I am trying to feel on this "anniversary") that the media haven't forgotten this terrible crime but then its more a testament of the loved ones fighting for those no longer here that people still talk about it. They never forgot or gave in and that it is the most fitting memorial of all. Amazing as this may sound, I never knew about the Lockerbie PA103 disaster until December 1998, when I watched a special on TV titled "After Lockerbie." It was not even planned that I was going to watch, I just happened to be flicking through the TV channels and came across a promo for it and thought I would tune in. As it turned out, I almost forgot about it. Upon watching the special, I was silently horrified and remember being sickened by the destruction. I had read about plane disasters before and knew the resulting outcome was not pretty but this was the first time I had seen graphic aerial footage. I remember seeing the crater at Sherwood Crescent and trying to figure out what it was? It never occurred to me at the time that the crater site housed several tenants' minutes before. What moved me more than anything else, were the interviews with family members who lost loved ones. I remember wanting to reach out and try and help them. Somehow change this terrible event. I guess its a normal human reaction. You see someone in pain, you want to try and help them out of it. I knew deep in my heart that their pain would never end. Thats the horrible thing about it. How does a person recover from something like this? Anyway, after watching the documentary, I was unable to sleep for days and kept wondering what it must have been like to have been in that jumbo jet when it started coming apart. What goes through a person's mind when they are facing certain death? Did the people on board that flight have time to process the reality around them? I remember reading a book once about people's psychological reactions to fear and remember that it was stated that some people revert back to their childhood and cry out for their mothers and fathers. Not a nice thing to think about. Especially knowing that everyone on board was heading home to be with loved ones for Xmas. Imagining what the families went through as they waited for news sickened me. Hence, why I decided to do this website. Anyway, thats it from me. I really hope the families see some justice in the trial, which is currently being held in the Netherlands. It was gratifying to see the media cover the trial so intensely on opening day but as I feared, they quickly lost interest and moved onto other stories. Less complicated stories. To them it is just another story to cover. It's not to me. This is about people's lives and what has happened to them. It's important to remember that behind every headline, there is a person and they deserve to be remembered. N739PA is delivered to Pan American World Airways, February 15, 1970. Originally named Clipper Morning Light the aircraft is renamed Clipper Maid of the Seas ten years later. A side cargo door is added to the aircraft during the month of September, 1987. The Clipper Maid Of The Seas departed London, Heathrow bound for New York, JFK Airport on the evening of the Dec 21, 1988 & was blown apart shortly after 7:02:50 as the jumbo jet was flying at its cruising altitude of 31, 000 feet above the small village of Lockerbie, Scotland, by a small bomb concealed in a suitcase and stored in the forward cargo compartment. The aircraft (which had had completed a total of 72,464 hours flying and 16,497 flight cycles) was scheduled to depart Heathrow Airport at 6:00pm but left behind schedule 25mins later. Had the flight not been delayed it would have blown up over the sea and would have been hard for investigators to solve the crash. The Maid of the Seas arrives in London 12:07pm, having flown in from San Francisco, and parks at stand K-14, where its passengers and cargo are unloaded. The jumbo jet, which had been delivered to Pan American World Airways February 15, 1970, has recently undergone an American Govt. funded overhaul in Wichita, Kansas, were technicians reinforced the cabin floor and made structural changes. In addition to this, the 747 received an extensive mechanical review one-week prior in San Francisco. Passengers intending to board PA103, are screened by Pan Am's security subsidiary, Alert Management Systems, Inc. However, no-one from Pan Am has bothered searching the cargo hold before luggage is loaded onto the plane and no-one has bothered telling Captain James B. MacQuarrie that the plane is carrying luggage that does not belong to any of the passengers who are now boarding. Among the passengers boarding the flight is 22yr old Christopher Andrew Jones, who takes a seat near a window five rows from the rear of the jumbo. Christopher has been studying in London as part of Syracuse University's student exchange program. Christopher had intended to make the flight with his girlfriend, Erica Elefant, but she instead handed in her ticket and opted to travel onto France instead. Christopher accompanied Erica to Pan Am's London office when she traded in her ticket and tried to persuade her to change her mind by saying he thought the trip to New York would prove to be a "real party flight." There were twenty-one different countries represented among the passengers who boarded Flight 103. Among them was sixteen year old Melina Kristina Hudson, who had been studying at Exeter but was now returning home as she was homesick and missed her family. Melina was excited about getting home as her mother promised to teach her how to drive and there was a prom in the not too distant future. There were people from all walks of life. People who were looking forward to getting home in time for Xmas, to share the special occasion with their loved ones and their families. Its important we remember that. They were people just like you and me. Who had hopes and dreams. People who deserved more than the terrible fate that awaited them just a few hours later. At London's Heathrow Airport, airline personnel worried about the Boeing 727 that was behind schedule. The 727, which had left Frankfurt, Germany, was to connect with the regularly scheduled Flight 103 to New York, which would be completed via a Boeing 747, and any delay behind schedule could mean that passengers would miss their flight and cost the airline money. Much to the airlines relief, the Boeing 727, finally touched down at the airport just after 5:40pm. The Boeing 727, which had originated at Frankfurt, Germany, parked at stand K-16, Terminal 3, next to the Maid of the Seas, a Boeing 747, that was to takeover the flight and continue on to New York City in the United States of America. The nightmares have not ended for the families whose loved ones perished aboard Pan Am Flight 103. Psychologists and doctors are treating many of them and for some the tragedy is played out night after night in their dreams. On Dec. 21 1988, just four days before Christmas, their children, brothers and sisters died aboard the plane that exploded over Lockerbie, Scotland, the target of a terrorist bomb. Now, as the Christmas lights glow once again and carols play on the radio, the signs of joy are, for them, like salt ground into the open wounds of their terrible sorrow. "Right now there's no joy with anything" said Joanne Hartunian of Niskayuna, mother of Lynne Hartunian, 20, a State University College at Oswego student who died on the flight. "This is what Christmas is for us now - happiness tinged with pain and sorrow. I can't stand to hear Christmas carols" she said. "There's always an empty seat at the table." "It's a very painful time" said Barbara Primeau of Troy, mother of twins Jason and Eric Coker, who were students at Rochester and Syracuse universities. "We don't celebrate holidays any more. We just observe them. It's supposed to be a time of peace and joy and my children were peaceful and joyful but it can never be that way again." The photographs of the crash scene haunt the families. Fields littered with twisted metal and bodies but it is in their similar recurring nightmares that many see what they dare not imagine in their waking hours - the destruction of the blue and white Boeing 747 called "Maid of the Seas." Some said it is a plane. For others, it is a blue and white bird that suddenly disappears in a flash. Then the sky is filled with silent people, falling endlessly six miles above the Earth. Most of the floating people are strangers, seeming to cry out for help. Then one of the faces looks familiar, just before it hits the ground. "I dream that the plane is coming apart and I can see the bodies falling out" said Georgia Nucci of Claverack, who lost her son, Syracuse University student Christopher Jones. For Nucci it was the second Christmas in a row in which she lost a child overseas. Her daughter, Jennifer, 18, died of diabetes and liver complications while studying in Ecuador in 1987. Sorrow is only one emotion felt by the families. There is also anger and the endless unanswered questions about what really happened and why? A year later, many of the pieces of the puzzle are still missing. They blame Pan Am and the federal government for not doing more to protect passengers and more to find out what really happened. "It turned out that the security was nothing but an illusion" said Primeau, who has been out of work on disability since the tragedy. "I feel like I've been betrayed" said Joseph Hartunian, father of Lynne. "It was an act of war and our government did nothing." "The way we are getting information, the way it is slowly unfolding is slow agony" said Richard Hartunian, Lynne's older brother, who went to Scotland and talked with the farmer who found his sister's body. They also believed that the government and Pan Am have not provided even the most minimal comforts to the victims' families. When Nucci went to pick up her son's body at Kennedy Airport, she found it in a plain box, stacked up with the others, in an open-air livestock warehouse. "They were stacked like freight" she said. "They brought him over on a forklift." Instead of his name, the box said only that it contained "Victim 29." "There was no one from Pan Am there" she said. "No one from the government. They sneaked those bodies back here." "They died for their country, just the way a soldier might have done" said Primeau, who sent back a letter of condolence from President Bush because she felt nothing was being done. "They weren't killed for who they were. They were killed because they were Americans. We trusted our government and the airlines to protect our children. We had too much faith in them." Eleanor Hudson of Albany said she was still getting back bits of her daughter Melina's luggage after it was identified in Lockerbie. Among the sad remains was one of the sensitive teenager's notebooks, in which she had written "No one dies unless they're forgotten." Two hundred and seventy men, women and children from 21 countries died in the Lockerbie disaster. There were American service families based in Germany, going home for Christmas with their relatives. There were young English couples flying to New York for shopping. There were thirty-five students, including Alexander Lowenstein, from Syracuse University in upstate New York - returning home after a four-month semester in London. The average age of the victims was just twenty-seven. Every family devastated by Lockerbie has found a different way of coping. Some have dedicated themselves to trying to improve air safety. Others have resolved to uncover the truth of who was behind the bombing. Everyone wants justice but many want revenge. The word "closure" is one, which the bereaved has come to hate but the feeling of unfinished business is all-powerful. No one has been identified as responsible for the bombing, although theories abound. The one given most credence is that Libya was behind the bombing - two Libyans have been indicted under Scottish law. The truth about Lockerbie is shrouded in bureaucratic secrecy, diplomatic evasiveness and political bet hedging. Perhaps one of the few aspects of the case that all the families agree on is that British and American intelligence knew far more than they will admit. Three weeks before the disaster, the US State Department had issued a warning to its diplomats that a Pan Am flight out of Frankfurt could be the target of a bomb. This warning was phoned to the US embassy in Helsinki early in December 1988 and circulated to American diplomatic staff all over Europe. The travelling public - however - was never informed. There have since been rumours of many bomb warnings but this is the only substantiated one - it was confirmed by the US State Department when the New York Times printed the memo which had been distributed to American embassy staff. Bob Monetti, who lost his 20-year-old son Rick says "It's all smoke and mirrors." Meanwhile, every time the possibility arises of the Libyans coming to trial, the wounds are reopened. Some have striven to put the past behind them, these families have steered clear of the Pan Am support groups in Britain and America. Others take comfort from the groups' meetings and the friendships generated by them. Some families have raised money to fund scholarships and awards dedicated to the memories of those they lost. Jane Schultz said the body of their son, Thomas, was returned on his 21st birthday (Jan 5). An honours student at Ohio Wesleyan University Thomas died returning from a Syracuse University program in London. ''People say to me how do you get through each day and I say well, we looked on our children as gifts and unfortunately we had to give them back sooner than we would have liked but we're richer for having them." At Tundergarth Mains Farm, Jimmie Wilson received an unexpected delivery as the cockpit of the Maid of the Seas, fell in his field. He ventured outside with his family to investigate and discovered three bodies in the wreckage. The Captain of Flight 103 had been ejected from the force of impact and lay a short distance away. Scattered across the field were pieces of wreckage and bodies. June Wilson commented "Some were like waxen dolls. Other people were dismembered. Feet were missing and others had been horribly compressed by the fall from 31,000 feet above." Robin Devlin found a young blonde haired man in his yard. "There was barely a mark on him but from the way he was laying, you knew all his limbs were broken." Today normal service may have resumed in Lockerbie. People still wander down to the bingo hall, haggle at sheep markets or tend to their farms as they did back then but scratch the surface and all the signs of one of the world's biggest air disasters still remain. Time has eased some of the trauma for the residents and aid workers who helped at the scene but flashbacks are common. Memories of the plane exploding, the shock, the aftermath, the carnage, the valiant rescue attempts and the posttraumatic stress that changed this town forever are still vividly clear today. Farmer Hugh Connell said: "We could see the plane, rolling, boiling up into the sky and then we heard noises all around us. It was difficult to judge where they were coming from in the darkness. It was a windy night and the pheasants were beginning to cackle in the woods. It sounded like bombs going off like thump, thump, thump in the darkness. We moved out into the fields and there were pieces every where." Dean still thought it was a cargo plane and then we came across a girl's shoes and belongings and then we realised it must have been a passenger plane. Then in the moonlight he (his son) had come across a seat with a body still strapped in it -- he was dead. "We searched a wee bit further, back towards the house because then we knew we needed help but we had no phone. All the phones around us had been cut off and the electric was off and it was then I think we realised how remote we were. We always enjoyed loneliness and quietness up here, but that night we seemed so far away from help and so far from everybody. Then we set off across the fields with the land rover and were coming up against one piece of wreckage after another. Pieces of the plane were one thing but luggage was another because every name you read you knew you were looking at somebody's life that had been halted - some family broken up." There is not one adult inhabitant of Lockerbie who does not remember where they were and what they were doing that 'Silent Night' approaching Christmas. It was a normal day with normal routines. Housewives recall how they were preparing for supper or for Christmas that evening when just after 7pm the Pan Am jet disappeared from the radar screen. Another couple, Jane Gibson and her husband, were returning from a festive party in London. They remember when they heard on hastily prepared radio bulletins the devastating news. No words, they say, can describe their journey back, the fear for friends and relatives and their desperate hunt for news. In a couple of minutes everything normal in Lockerbie was turned upon its head. 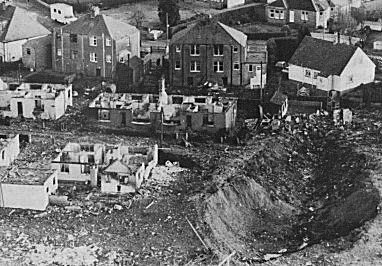 The explosion ripped through houses, left a huge fuselage in gardens where children used to play and sent Sherwood Avenue up 'like an atomic mushroom.' The town's population increased from 3,500 to 10,000 overnight. Local people did what they could to assist in the rescue operation, providing food, shelter and comfort for grief stricken relatives in a foreign country. For every story there are a hundred others but among the most poignant is that of a young mother with two children who lived in New York with her husband. He was an executive with an international firm who regularly held conferences overseas. His wife was determined that this Christmas he would remain with his family but her husband insisted on going to boost his career. So for the weeks prior to the conference they argued together. But no he was determined - work came first and then on the night he was due to fly out for the last time his wife pleaded with him not to go, but no, he was going. In the morning the taxi came to run him to the airport and he put his arms around his wife to kiss her goodbye but she pushed him away. That fact probably festers in that woman's brain and today is something she will never be able to come to terms with. 25/5/2000: An air accident investigator has told the Lockerbie trial there was a significant mathematical error in the official report on the disaster. In highly technical but potentially crucial evidence, Christopher Protheroe said he informed prosecution lawyers in a meeting on Monday that a complex formula used to calculate blast wave effects after an initial explosion had been incorrectly applied in the 1990 report. He admitted that correct calculation of the so-called "mach stem" phenomenon would indicate that the bomb which destroyed Pan Am Flight 103 over Scotland went off closer to its fuselage skin than originally thought. The effect is created when a bubble of super-heated gases expands violently after explosives are detonated. The report by the UK's Air Accident Investigation Branch (AAIB) indicated that damage discernible in debris from the forward cargo hold showed that the distance would have been about 25 inches (63 cm). On evidence on Thursday, Mr Protheroe said the distance, if calculated correctly, would be about 12 inches (30 cm). The prosecution alleges that Abdel Basset al-Megrahi and Al-Amin Khalifa Fahima, working as Libyan intelligence agents, planted a bomb in an unaccompanied suitcase in Malta which was eventually loaded onto the doomed aircraft in London. The crash killed all 259 people aboard and 11 people on the ground on 21 December, 1988. Earlier, Mr Protheroe held up a model of the jumbo jet, with red, green and yellow patches showing how the plane had disintegrated in mid-air. Relatives of the victims and the defendants watched as he used the model and diagrams to illustrate the catastrophic effects of the explosion. He described how the blast initially blew a 20 by 20-inch (50-cm) hole in the fuselage and created further "starburst fractures" and "petalling" of the plane's metal skin from the subsequent explosion of hot gases. 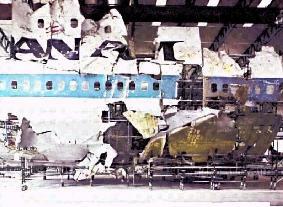 AAIB photographs produced in court of a partial three- dimensional reconstruction of the smashed plane showed clear evidence, Mr Protheroe said, of a "shatter zone" in the left front cargo bay almost directly under the second "A" in the Pan Am logo on the side of the jet's giant forward cabin. The trial was adjourned again, this time to allow a baggage container from the aircraft to be brought into court. Air accident investigators have reconstructed the metal container, which is too big to be brought through the courtroom doors. It may have to be taken apart and rebuilt again in front of the three judges in a process, which could take a whole day. 25/5/2000: A British air accident investigator told the trial of two Libyans accused of the 1988 Lockerbie aircraft bombing on Thursday there was a significant mathematical error in the official report on the disaster. In highly technical but potentially crucial evidence, Christopher Protheroe, a senior inspector with the Air Accident Investigation Branch, said he informed prosecution lawyers in a meeting on Monday that a complex formula used to calculate blast wave effects after an initial explosion had been incorrectly applied in the 1990 AAIB report. Under intense cross-examination from defence lawyer Richard Keen, Protheroe admitted that correct calculation of the so-called "mach stem'' phenomenon, which occurs when a bubble of super-heated gases expands violently after explosives are detonated, would indicate that the bomb which destroyed Pan Am Flight 103 over Scotland went off closer to its fuselage skin than originally thought. The AAIB report indicated that damage discernible in debris from the forward cargo hold of the plane showed that the distance would have been about 25 inches Protheroe said in his testimony on Thursday that the distance, if calculated correctly, would be around 12 inches. The prosecution alleges that Abdel Basset al-Megrahi and Al-Amin Khalifa Fahima, working as Libyan intelligence agents, planted a bomb in an unaccompanied suitcase in Malta which was eventually loaded onto the doomed aircraft in London. If the defence is able to create doubt that the bomb actually exploded inside a luggage container in the plane's cargo bay, it would be a serious blow to the Crown's case. The crash killed all 259 people aboard and 11 people on the ground when flaming wreckage rained down on Lockerbie, Scotland on the night of December 21, 1988. Protheroe testified in the specially built Scottish court in the Netherlands that he was not able to remember whether the crucial calculation in the final AAIB report had been carried out by his team or by outside experts in explosive effects commissioned by the board in the course of its investigation. "At this point I'm not certain what is the reason for that error" Protheroe said. Law professor John Grant, observing proceedings for Glasgow University's Lockerbie Trial Briefing Unit, said the development "was not helpful to the Crown's case at all." "The question of the exact location of the bomb inside the cargo hold is crucial" Grant told Reuters. The defence need not prove anything under Scottish law but only cast sufficient doubt about the Crown's case in the minds of the three-judge panel for there to be an acquittal or a verdict of "not proven." 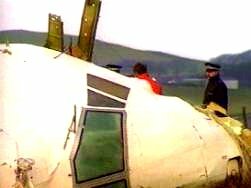 Earlier, Protheroe held up a model of the jumbo jet, with red, green and yellow patches showing how the plane had disintegrated in mid-air. Family members of the victims and of the Libyan defendants watched as he used the model and diagrams to illustrate the catastrophic effects of the explosion. Outside the court, Jack Flynn of New Jersey, who lost a 21-year-old son in the disaster, said he had found that part of the testimony difficult to watch. "What I was thinking about, when I saw those pictures of the wreckage reassembled on a hangar floor, was where my son had been sitting when that plane broke up" a tearful Flynn told Reuters. As another AAIB investigator had done in his testimony on Wednesday, Protheroe described how the blast initially blew a 20 by 20 inch hole in the fuselage and created further "starburst fractures'' and "petalling'' of the plane's metal skin from the subsequent explosion of hot gases. AAIB photographs produced in court of a partial three- dimensional reconstruction of the smashed plane showed clear evidence, Protheroe said, of a "shatter zone" in the left front cargo bay almost directly under the second A in the Pan Am logo on the side of the jet's giant forward cabin. As the morning session ended, judges were considering a defence request that a full size reconstruction of a damaged cargo container be allowed into the cramped well of the courtroom. Presiding judge Lord Sutherland asked that during the lunch break defence and prosecution lawyers decide how that could be achieved and whether proceedings might have to be adjourned to allow the necessary work to be done. 25/5/2000: A Scottish newspaper severely criticised at the trial of the two Libyans accused of the Lockerbie bombing has said it is standing by its claims. The Sunday Herald reported that the prosecution case was in tatters amid concerns over evidence due to be provided by a man described as a key witness. The newspaper alleged that the "disarray" had prompted the Crown to seek a 12-day adjournment in the case. Scotland's Lord Advocate, Colin Boyd QC, told the court there was no truth in the allegations and statements attributed to Crown Office sources had not been made but in a statement on Wednesday, the newspaper said "The story was accurate and, we believe, in the public interest. We will print a full and robust response to the criticisms in our edition on Sunday." The presiding judge, Lord Sutherland, had warned that if the case had been a normal jury trial the newspaper report, on 14 May, would have been gross contempt. Mr Boyd described the article, which reported allegations that the case was about to collapse after an analysis of the explosion from witness Edwin Bollier allegedly contradicted the Crown's version of events, as "largely inaccurate and misleading." He said it was not for those reasons that he brought the article to the judges' attention, but because "it makes allegations about the Crown's conduct which impinge on our relationship with the court." Mr Boyd said he would not comment on the report, which he has received from the Crown witness, except during submissions to the court and was not prepared to comment on the assertions made in the article. He said no member of his team nor anyone with any knowledge of the Crown case had spoken to the Sunday Herald. He criticised the implication that the Crown had mislead the court and insisted the reasons for the adjournment were as stated - to give his team time to interview vital witnesses. Mr Boyd said evidence referred to in the article would be "unacceptable" if the trial was by jury. However, he was not making a submission that the newspaper was in contempt of court. He went on to praise the "generally fair, accurate and balanced" reporting of the trial by news organisations covering the case adding, "I hope they will remember that it is the evidence in court that matters." Presiding judge, Lord Sutherland, said the court had accepted the reasons why the Crown had requested the adjournment and said he regretted the "lamentable article." He added, "If this had been a jury trial an article of this nature would have been a gross contempt of court." The trial also heard from police witnesses who described how certain items of debris collected after the disaster, such as pieces of charred suitcase, were sent for analysis by forensic scientists at the Royal Armament Research and Development Establishment (Radre) at Fort Halstead, in Kent. Former Strathclyde detective Brian McManus told how items brought into a store at Lockerbie were sifted and anything thought to have "future evidential value" was sent to the Radre laboratories. The two accused men, who deny causing the disaster, were alleged to have caused a suitcase containing an umbrella, clothing and an improvised explosive device concealed within a radio cassette recorder to be placed on board Flight 103. It allegedly detonated on board the aircraft on 21 December 1988, killing all 259 passengers and crew and 11 Lockerbie residents. The chief air accident investigator in the Lockerbie bombing described in court the cataclysmic effects on the Pan Am jumbo jet as it exploded from the sky. Michael Charles, a principal inspector for Britain's Air Accident Investigation Branch (AAIB), gave evidence about the disintegration of the plane half an hour into its flight from London to New York. Referring to the findings, diagrams and models in the AAIB's exhaustive report on the crash, the former RAF squadron leader and test pilot dissected the smashed body of the aircraft, indicating where fractures and other damage had occurred. Mr Charles said the mid-air destruction was so enormous that at one point the severed cockpit smashed in mid-air into the plane's Number 3 engine. It was concluded that the origin of the explosion was in the plane's forward cargo hold. A blast had blown a 20 by 20-inch (50-cm) hole in the fuselage and there were characteristic "starburst fractures" and "petalling" of the plane's metal skin from a subsequent explosion of hot gasses. Mr Charles acknowledged that effects change the further away from the fuselage an explosion occurs. This may be crucial to the case, as prosecutors allege the bomb was concealed in a suitcase, stored some distance away. The trial continues. 27/5/2000: The two Libyans accused of downing PanAm 103 could not have planted the bomb according to a devastating scientific report submitted by one of the Crown's star witnesses. The report has thrown the prosecution case into disarray and forced the adjournment of the Lockerbie trial for twelve days. The report concludes that the Semtex bomb was attached to the inside of the aircraft in the cargo hold and was not concealed, as the prosecution case alleges, within a cassette player packed into a suitcase which was stored within a luggage container in the cargo hold. A senior legal expert said of the new development last night "I think this case is ready to collapse. The prosecution is now running around like a headless chicken. They know (the case) is going to go belly up but they don't want the fallout to hit them. At this point, I think the prosecution have no anticipation of a conviction but they are going to try and drag out the case for as long as possible so they can say that they tried their best." Senior Crown Office sources have admitted to the Sunday Herald that the report submitted to the Lord Advocate, Colin Boyd, just days before the trial started provided such startling new evidence that the prosecution had no alternative but to seek an adjournment to consider the future of the trial. In a stunning own goal for the prosecution, Edwin Bollier, who is listed as prosecution witness number 548, delivered a detailed analysis of the explosion to the Lord Advocate, claiming the Crown's version of the bombing was scientifically impossible. The potentially lethal blow comes from the man that the Crown intended to call to crucially link the Libyans to the bomb's timing device. Bollier's Swiss company, MEBO, is said by the Crown to have made the timer used to detonate the bomb. The prosecution case stands and falls on proving that the Libyans placed the bomb inside the cassette player. 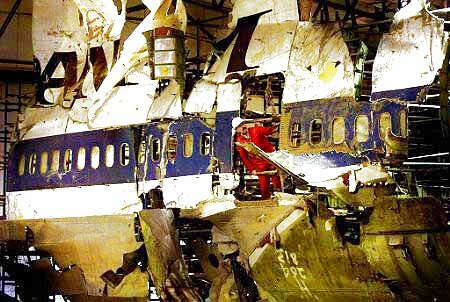 If the bomb was placed on the inner wall of the cargo hold, as the Bollier report claims, the link between the Lockerbie bombing and the Libyans would be broken. The Crown clearly states that Abdelbaset Ali Mohmed Al Megrahi and Al Amin Khalifa Fhimah, placed the cassette player, packed with explosives, into a suitcase containing clothes and an umbrella onto a flight leaving Malta. The bomb later exploded over Lockerbie. Bollier, who was legally manufacturing timing devices, initially told Scottish police, prosecutors and the FBI that recovered fragments of the timer found in woodland near Lockerbie were fragments of timers he had sold to the Libyan government. However, Bollier later changed his mind. In September last year, when he claims he was finally shown the actual pieces of the timer by police in Dumfries, Bollier was adamant that the fragments were not the same timers he had produced. Following this, Bollier commissioned scientists, who he refuses to name, to investigate the downing of PanAm 103. Their findings make up the report he has submitted to the Lord Advocate. In effect, Bollier has become a hostile witness to the prosecution who could now destroy the Crown's case. Crown sources said "The last thing the prosecution wants to do now is call Bollier, but they know that if they don't call him then the defence will. It's a horrible Catch-22 for the Crown. The prosecution needs to establish a link between the Libyans and the timer, so the prosecution has to call him, but if they call him he will destroy the prosecution case. It's lose-lose, whatever way you look at it." Bollier's report also says the blast damage to the aircraft shows that the bomb was placed directly on the inside wall of the cargo hold. The report claims that the shape of the wreckage fragments also proves the bomb was attached to the aircraft's inner wall rather than inside the luggage container. It also says that if the bomb was held in a cassette player, in a suitcase and in a luggage container, the shockwave of the explosion would have been muffled by its surroundings and not being powerful enough to down the plane. The report pinpoints a specific spot on the inner wall of the cargo hold, which it says was the position of the bomb. The authors claim this can be worked out by the shape of the wreckage adding "Previous forensic examinations should have come to the conclusion that the explosion did not occur inside the luggage container." The bomb, the report claims, was placed behind a fibreglass shell inside the cargo hold. Panels of the fibreglass shell could be unscrewed and lifted off allowing access to the inside wall of the planes cargo hold. The report says "MEBO wants the Lord Advocate to examine these findings as a matter of priority, with the help of first-class neutral, qualified explosives experts. A new investigation into this matter is urgently necessary for all the participants and is of the -highest importance. In the event of our new findings being confirmed by experts, the charges against the two Libyans have to be dropped." The prosecution successfully asked for the case, being heard at a Scottish court sitting at Camp Zeist in the Netherlands, to be adjourned for twelve days. Alistair Campbell QC said the Crown needed more time to interview witnesses over technical and scientific matters relating to the destruction of PanAm 103. Senior Crown Office sources said "The adjournment was because of Bolliers report. He passed his report to the prosecution and the feeling is that it could absolutely screw the case. If the Bollier report is true, the Libyans quite simply couldnt be guilty of the Lockerbie bombing. There is a feeling that this could destroy the case." Bolliers company, one of the most successful of its kind in the world prior to the Lockerbie bombing, was effectively ruined when MEBO was connected to the bombing of PanAm 103 as the source for the explosive devices timer. Bollier intends to sue the FBI for around £25 million if the Libyans are cleared. Crown Office sources say the prosecution has taken his report "extremely seriously." Bollier also sold timers to the East German secret-service, the Stasi, which had strong links with the Popular Front for the Liberation of Palestine-General Command which is the Middle Eastern terror group which the Libyans defence team is to incriminate in court as the perpetrators of the bombing. 27/5/2000: As relatives listened to painful accounts of their loved ones deaths, witnesses recalled the 1988 explosion of Pan Am Flight 103 and seeing flames rain down along with the remains of the jumbo jets two hundred and fifty-nine passengers. "The fire was falling down from the sky" said Jasmine Bell, whose brother lived near the three houses on Sherwood Crescent that were swallowed by a huge crater carved by the plane's wreckage. "Everything was burning - the driveway, the lawn, the hedges, the rooftops" the 53-year-old social worker testified. "I stepped back until my back was against the wall and I couldn't go any further." Bell's brother pulled her to safety in his home. She was not hurt. Later, when she walked out to survey the damage with her son, the stumbled over something. "My first reaction was that it's okay, its just meat." "Then I registered that obviously it was not meat.'' When the fire subsided, her brother went out to cover the dead with white sheets. "The devastation was just so incredible" said Kathleen Flynn, who attended the trial because her son was on the plane. "Everyone had warned us not to go. They said its just too painful and yet in my heart I knew I had to go." The relatives looked grim as they heard witnesses tell of bodies and body parts in the streets, screams emerging from residents houses and the stench of aviation fuel. "Shes smart, bringing in a whole box of tissues" one American relative told her husband as she took her seat for the trial session, referring to another bereaved woman. 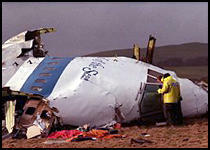 One witness, 37-year-old Lockerbie resident Ian Wood, told the court his hair had begun falling out after the tragedy. "[The plane wreckage] looked like an atomic bomb,it was pure red and like mushrooms flaring up" he said. Bricklayer Stuart Kirkpatrick said the scene was "like pictures of the Hiroshima bomb going off." "Lockerbie was in shock for a long time. I believe one young lad has done away with himself. There were a lot of solemn faces and no smiles for a long, long time," Kirkpatrick said. All 259 aboard the aircraft and 11 Lockerbie residents were killed in the atrocity, alleged by prosecutors to be the work of two members of Libya's secret intelligence service in conspiracy with unnamed others. "The house was blown up but they were never found" said Lockerbie resident William Pattie, who lost his sister-in-law and her husband. "The bungalow they lived in just vanished in the crater.'' Electricity was knocked out. Witnesses heard screams from neighbours' houses and breathed the stench of aviation fuel. Members of about 40 families bereaved by the destruction of Flight 103 from Frankfurt via London to New York listened quietly to the testimony, some holding hands for support. Roland Stephenson said he was parked outside Lockerbie railway station when he heard a thunderous noise. He saw a fireball in the sky and moments later "a black mass with lights, gliding at a shallow angle over the town." He said he saw the entire wing of the plane "from wingtip to wingtip'' descending with "no fuselage, no tail, no engines." The only laughter of the session came when Stephenson concluded his testimony with a report of official disbelief. "I went to the police and told them all that I had seen. The policeman listened to my story and decided to write it down. That was the last I heard of that" he said. The father of an American passenger who died in the crash said the scenes described were reminiscent of a war zone. "It brings home the horror of how this hit the Scottish people. These people were literally bombed" said Jim Wolfe, who lost his daughter Miriam, 20. "When you hear the description it sounds like a world war." Car mechanic William Wilson said his colleague left work half an hour before tragedy struck and was never seen again. When Wilson went to check the next day, he found only the man's car next to a hole where the house once stood. "Lockerbie was in shock...there were a lot of solemn faces and no smiles for a long, long time'' another witness said. Abdel Basset Ali al-Megrahi and Lamen Khalifa Fhimah have pleaded innocent to the bombing of PanAm 103. They accuse Palestinian terrorists of the planting of the bomb, which destroyed the Maid of the Seas. If convicted, they face life in prison in Scotland. The indictment states the two were intelligence officers who used Libyan time-bomb techniques to detonate Semtex plastic explosives in the belly of the aircraft. The defendants listened through earphones to an Arabic translation of the testimony as Lockerbie residents testified from the witness stand in the centre of the bulletproof glass enclosed courtroom at Camp Zeist, a former U.S. Air Force base 40 miles east of Amsterdam. As prosecutors displayed street maps on video monitors, the witnesses vividly described how bright orange fireballs vaporised houses. They recalled engine pods and wing sections hurtling across the sky, skimming rooftops, slamming into the ground and they told how debris and devastation blanketed the town. Geoffrey Carpenter, the traffic police superintendent, was off duty when an almighty explosion blew open the door to his home. "There was an inrush of air from the outside. I ran out into the front garden and there was a glow in the sky and debris up to between 400-600 feet in the air." Carpenter, the last of the 11 witnesses to testify Thursday, was the first witness in the trial to be cross-examined by the defence. Questioned by Bill Taylor, who represents Al-Megrahi, the policeman confirmed that it would have been impossible to secure what the lawyer described as "a crime scene of that size." Taylor also asked him when the first reporters and investigators arrived on the scene and what "modern and sophisticated equipment" they brought (?) suggesting that the evidence could have been tampered with. Carpenter saw reporters within 11/2 hours and said FBI staff came two or three days later with digital cameras and satellite communications equipment. Kevin Anderson, 35, a plasterer from neighbouring Tundergarth, was working on his car when the cockpit fell intact in the field next to his home. The name of the aircraft 'Maid of the Seas'' was still legible on the aluminium skin. "We went over to the cockpit to see if anyone was alive? I had a torch. We looked inside the cockpit. I could see the pilot." For many in the Lockerbie community, the trial reawakens traumatic memories. "It brings it all home" said Carpenter, trembling as he spoke. "I would like to hope that at the end of this court proceeding we'll get back to normality. It's something that affects the rest of our lives." "I do my best just not think about it" said Stuart Kirkpatrick, who found the body of a young girl a few feet from his doorstep. "It's the easiest way to get through." 30/5/2000: An explosion tore through a cargo container aboard the Pan Am jumbo jet that disintegrated over Scotland in 1988, an air accident investigator told the Lockerbie trial Tuesday. Judges viewed blackened and twisted parts of the container when the trial resumed after a two-day adjournment called so it could be reconstructed in the specially built Scottish courtroom on a former U.S. airbase in the Netherlands. 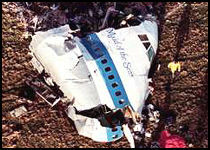 Pieces of the container, with blue Pan Am insignia on its mangled side panels, were crowded into the well of the court. 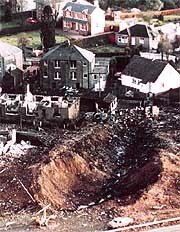 British accident investigator Peter Claydon testified that a "high energy" blast occurred within the container, supporting prosecutors' allegations that a bomb hidden in a suitcase brought down the plane on December 21, 1988, killing all 259 people on board and 11 on the ground in the Scottish town of Lockerbie. They accuse Libyans Abdel Basset al-Megrahi and Al-Amin Khalifa Fahima of hiding an improvised bomb in an unaccompanied brown Samsonite suitcase which originated in Malta, where they were working for Libyan Arab Airlines. Prosecutor Alan Turnbull asked Claydon several times to confirm that the blast occurred inside, not outside, the cargo container. The defence, expected to argue that Palestinian extremists operating in Frankfurt were responsible for putting the bomb on board Pan Am Flight 103, has been zeroing in on any testimony that may cast doubt on exactly where in the plane the explosion originated. Claydon, an engineering expert with Britain's Air Accident Investigation Branch (AAIB), said the pattern of damage to the container led him to conclude the explosion originated from its aft corner nearest the wall of the aircraft. Warped side panels curving outwards like flower petals indicated that the blast pushed upwards from near the bottom of the container, Claydon said. The floor of container AVE 400 was cratered but not blackened, so the bomb was probably in a suitcase sitting on top of another one, he added. Last week another investigator testified that there was a significant error in the 1990 AAIB report on the disaster since a formula used to calculate blast impact waves had been incorrectly applied. AAIB expert Christopher Protheroe said that correct calculations would have indicated the bomb went off around 12 inches from the fuselage skin, rather than 25 inches as stated in the report. Turnbull asked Claydon Tuesday to painstakingly identify each of dozens of pieces of the reconstructed container. The prosecution has the burden of proof and the defence can win an acquittal simply by creating sufficient doubt in the minds of the three judges hearing the case that the defendants were responsible. Presiding Judge Lord Sutherland rejected defence lawyer Richard Keen's objections that Claydon had not been presented as an expert on explosive damage and blast waves and so should not be allowed give his opinion on the cause of the damage to the container. 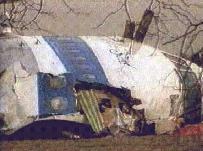 31/5/2000: An aluminium baggage container that was pieced together from the wreckage of Pan Am Flight 103 had been destroyed by an explosion, the Lockerbie trial was told yesterday. The 6ft high container, dismantled last week because it was too wide to fit through the doors of the courtroom, is said by the prosecution to have held the 1lb Semtex bomb that brought down the New York-bound Boeing 747 killing all 259 people on board. Yesterday Peter Claydon, an official with the Air Accidents Investigation Branch (AAIB), who carried out the original reconstruction, said he believed that the luggage container was damaged by a "high-energy" event. "I think, taking everything together, it was quite an unusual sort of damage. It sort of indicated to me that it was quite a high-energy event," he said. "Mostly from the intensity of the pattern on the floor . . . the first thing that occurred to me, and other people as well, was the possibility of an explosion. I have no doubts in my mind that such an event occurred from within the container." Mr Claydon, 53, said that he reached the conclusion after studying the differing degrees of damage to different sections of the hold, including the floor and outboard panels, one of which clearly displayed the blue-and-white Pan Am logo. "In a broad sense, it did appear the focus for this damage would have been in the outboard quarter of the container," he said. Mr Claydon said that the differing degrees of damage inflicted on parts of the container led him to believe its floor had been protected from the blast. "The first thing was that the surface had been protected by a piece of baggage - something that did not allow the direct effects of an explosion to impinge upon that surface," he said. Mr Claydon said he thought it likely that the bomb was inside a piece of baggage that was not on the floor but on top of another suitcase. The prosecution claims that the two accused Libyans, Abdel Baset Ali al-Megrahi, and Lamin Khalifa Fhimah, were responsible for a suitcase containing the bomb being placed in the luggage container alongside some clothing on the aircraft. The men have denied charges of murder, conspiracy to murder and breaching the 1982 Civil Aviation Act. Their lawyers have lodged a special defence blaming two Palestinian terrorist organisations and ten individuals for the atrocity. Later the court, at Camp Zeist in The Netherlands, was told that Mr Claydon tested the reconstructed container at the Air Accidents Investigation Branch headquarters in Farnborough, Hampshire, to establish the site of the centre of the explosion. He said that he had also reconstructed part of a fibreglass container that was separated from container 4041 by a plastic curtain. "A lot of information . . . came from the adjacent container," he said. He also found a fragment of circuit board in a fold of the metal. "I picked it up and looked at it, as you do. It had the potential to be associated with a device but it could have been out of somebody's shaver, computer or anything," he said. Under cross-examination by Richard Keen, QC, representing Mr Fhimah, Mr Claydon said he had not cleaned the evidence before passing it to police officers. "I'm not a forensic scientist, but I am aware of some of the potential problems of contamination. The worst thing I did is pick it up before I understood what it was," he said. The trial continues. 31/5/2000: The Lockerbie trial is to be recorded for posterity by an artist-in-residence, as part of the Government-backed Year of the Artist project. Cameras are not allowed into Camp Zeist, the court in The Netherlands, which has become a corner of Scotland for the trial of two Libyans accused of planting the bomb on Pan Am Flight 103. So the Glaswegian artist Nathan Coley, 32, has been chosen to provide a unique record. He emphasised that he is not a regular court artist and his intention is not to document the trial in detail but to examine wider issues both within the courtroom and beyond it. "I'm more interested in this place in the middle of Holland, this area of Scotland in the middle of Europe," Mr Coley said. He is among more than 1,000 artists who are taking art to places where people would least expect to find it, as part of one of the most ambitious arts projects to be mounted in Britain. The Year of the Artist runs from this Thursday until next May, under the auspices of the arts councils of England, Scotland, Wales and Northern Ireland and regional arts boards. Mr Coley, who graduated from the Glasgow School of Art in 1989, has explored some preliminary ideas after spending last week at the Lockerbie trial. His eye, he said, may extend from the families of the bomb's 270 victims to "the lady who runs the cafeteria in the town and ideas such as who owns the air above the camp. Is it Scottish for the year or is it still Dutch?" His residency is backed by the Scottish Arts Council. Talks are under way for an exhibition. 4/6/2000: An Iranian defector claiming to have run Iran's terrorism program has told "60 Minutes" that Iran planned and financed the 1988 bombing of Pan Am 103. Ahmad Behbahani was the coordinator of Iran's overseas acts of terrorism for the past decade and "60 Minutes" interviewed him after checking out his story with administration officials in Washington. Ahmad is now in protective custody in Turkey. Behbahani claims he has documents that prove Iran orchestrated the bombing over Lockerbie, Scotland, for which alleged Libyan agents Abdel Basset al-Megrahi and Al-Amin Khalifa Fahima are being tried by Scottish judges in a Netherlands courtroom. He says that Iran hired the Libyans, brought them to Libya, trained them, the bomb was built in Libya and then they were sent off to perpetrate the crime. Defence lawyers for the two Libyans have made clear they intend to cast suspicion on a Palestinian group as the party responsible for the bombing. Under questioning by the defence, Scottish detective Gordon Ferrie confirmed in court that a Syrian-backed Palestinian terrorist group was initially suspected in the bombing but was later dropped as a suspect for lack of evidence. A spokesman for that group, the Popular Front for the Liberation of Palestine-General Command, is denying any involvement. Israel's Ha'aretz newspaper has reported that a British public relations firm working for the Libyan government is looking for Israeli intelligence officers to testify for the defence and place the blame on Palestinian terror groups. Iran vowed the skies would "rain blood'' after the USS Vincennes shot down an Iran Air flight in July 1988, killing 290 people. 4/6/2000: Former DEA agent and whistleblower Les Coleman has received a ten-month sentence in an Uniondale courtroom. Coleman is a former DEA-agent, who claimed the bomb was smuggled aboard Pan Am 103 camouflaged as a drug-luggage, cleared to enter the USA by the very DEA itself in payment for arms and hostage deals made by the American government and a Syrian armsbroker, Monzar Kassar. Coleman was released on probation from a perjury sentence by Judge Thomas Platt but (alleged) money fraud accusations brought Coleman back in jail late summer 1999. The hearing of the morning trial session lasted three hours. Present were Coleman and his attorney, the plaintiff (US Govt) represented by Special Agent David Edward, plaintiff's attorney. Coleman and his attorney believe this sentence is retroactive to September 1999. If this is true, Coleman will be released on July 3, 2000. If the sentence will not credit him for time already served, however, he will be held until next February. Coleman told his friends that Agent Edward was visibly outraged by the relative lightness of this sentence. Coleman said he truly believes that Platt was moved by the content of the many letters he received from members of Raye's group (an organisation in support of Coleman). An American relative of a victim from Pan Am 103 reacted to the news of Coleman's sentence by saying "Lester Coleman's Pan Am 103 conviction has been reaffirmed and he is going back to jail for ten months for violating his probation. All of the information that has been posted about how this "whistleblower" has had his conviction reversed or how he will be able to withdraw his confession or get a new trial or testify at the Lockerbie trial is absolute nonsense. Coleman is a con man and not a very good one because he keeps getting caught." 06/6/2000: Palestinian guerrilla chief Ahmed Jibril has denied charges by an alleged Iranian defector that his group was involved in the bombing of PanAm 103. Jibril, head of the Popular Front for the Liberation of Palestine-General Command (PFLP-GC), said the charge was ''fabricated by the United States to pressure the Palestinian opposition, especially our group which opposes the so-called Palestinian-Israeli peace negotiations." " We strongly deny this charge, which is totally baseless'' he said in a statement to Reuters. Lawyers for the Libyans have suggested they will try to prove Syrian-backed Palestinian extremists were the perpetrators in an act of revenge on behalf of Iran for the destruction of an Iranian plane by a U.S. warship six months before Lockerbie. "This charge against the PFLP-GC is not new. Whenever they need to pressure the Palestinian opposition they revive this claim'' Jibril said. "We believe that our position which refuses the capitulation and humiliation of deals with Israel and our insistence on the armed struggle to liberate our occupied lands and regain our legitimate rights is the main factor behind these baseless allegations'' Jibril said. The PFLP-GC leader has accused the Israeli intelligence service (Mossad) and the Central Intelligence Service (CIA) of being the real operators behind the Lockerbie bombing. 11/6/2000: His tropical turquoise shirt bulges at the belly. His thick grey moustache bushes out over his lips. His kindly, brown eyes disappear behind wrinkles at his frequent smiles. Ahmed Jibril has little about him of the steely terrorist mastermind. Indeed, he would not have you think of him that way. "I am not a terrorist or an extremist," he says. "We have injustice heaped upon us and so I take the course I do." In a two-hour interview with "The Scotsman" the jocund, roly-poly Mr Jibril took a less than grandfatherly tour of his expertise in explosives, his hatred of Israel and his rejection of Yasser Arafat s peace process. Mr Jibril has hit the headlines once more this week, after an Iranian defector accused him of being the mastermind behind the attack on Pan Am flight 103, which exploded over Lockerbie in 1988. The defector, Ahmad Behbahani, says he recruited Mr Jibril to provide advice on explosives for the operation, which also included Libyans. The 62-year-old leader of the Popular Front for the Liberation of Palestine-General Command maintains there is nothing to the new accusations. He believes the charges are intended to "mislead and confuse" the Scottish judges presiding over the trial of two Libyans in the Netherlands. "I am sure the Libyans will be cleared in the court in Holland," he says. "There is no evidence." He says that the bomb could not have originated in Malta, as the prosecution asserts, and that any of the likely methods to detonate such a bomb would have been ineffective unless the device was loaded in London. Explosives linked to an air pressure gauge, which would have detonated when the plane reached a certain altitude or to a timer would have been ineffective, Mr Jibril said. The pressure on the flight out of Malta would have detonated the bomb long before it was loaded on the Pan Am jet, while the timer would be inaccurate. "I know all about the science of explosives. I am an engineer of explosives. I will argue this with any expert that the bomb went on board in London. I do not think the Libyans had anything to do with this." He also denies ever meeting Mr Behbahani, now being interrogated by the CIA in Turkey. "This scenario is ridiculous." Mr Behbahani's claim marks the second time Mr Jibril's group has come in for suspicion over Lockerbie. For several years, he was the prime suspect, before attention turned to Libya. The Libyans defence lawyers have said they will seek to establish reasonable doubt about their clients guilt by implicating Mr Jibril but Mr Jibril instead accuses Israel's Mossad secret service of reviving the charge against him to make the Palestinians look bad and to turn attention away from the hasty withdrawal of Israeli troops from Lebanon. "The PFLP-General Command never did any military operations, except against Israelis or the Israeli authorities" says Mr Jibril, whose group still has training camps in Lebanon. "The Israelis engineered all this new accusation against us." 12/6/2000: A spokesman for British victims of the Lockerbie bombing has appealed for immediate action to get the trial of the Libyans accused of the atrocity back on track. Dr Jim Swire said a row over translation, which stalled the trial last week, could reflect badly on the defence and prosecution teams and the United Nations. In an open letter sent to the BBC, Dr Swire asked why, after more than a month of proceedings at the UN-brokered trial, the issue of translation had only just been raised. Dr. Swire wrote in part "The Zeist court has been sitting for over a month. Why are we only now hearing that the accused are unable to understand the proceedings through translation difficulties? From the public side of the bullet proof screen it looks discreditable to the Defence, the Prosecution, and the United Nations. On our side of the glass we have excellent earphones which have channels available in both English and Arabic. The UN has been provided with special booths within the public section of the court which no doubt have at least similar facilities. Why have the anticipated UN observers not criticised the translations long before this? The defence team surely have a duty to ensure that their clients are able to understand the proceedings before them. Why has it taken till now for the redoubtable Mr Taylor and Mr Keen to raise the matter in the court? It is understood that it is the responsibility of the Prosecution to see that translation facilities are in place. Why have they not provided adequately for this? The Court, through Lord Sutherland, has pointed out that the situation where the accused are unable to understand is simply not acceptable under either Scottish or European law." "This trial must be fair, the entire future of two men's lives depends upon it, not to mention the good name of Scottish Criminal justice. Justice must be seen to be done, not only in Anglo-Saxon countries but also throughout the Arab World. If the court so decides, perhaps the UN could now use Kofi Annan's good offices in Libya, coupled with the recently reinstated diplomatic facilities under the UK ambassador to Tripoli, Richard Dalton and Libya's expressed support for these proceedings, to facilitate recovery from this unfortunate impasse." 1/7/2000: There are some personal tragedies that never reach that counsellor-induced state known as "closure." Just ask Susan and Daniel Cohen. On December 21, 1988, their 20-year-old daughter, Theodora, was one of 270 people killed in the terrorist bombing of Pan Am Flight 103 over Lockerbie, Scotland. Since that day over 11 years ago, the Cohen's have given themselves over to grief therapy. They have talked to various news outlets until they are blue in the face. They have made a mission to help bring the guilty to justice. They have even written a book about their experiences. And still, they are bitter and angry. "A lot of friends say, 'Are you ever going to feel better?'" says Daniel Cohen during a phone interview to promote the book, "Pan Am 103: The Bombing, the Betrayals, and a Bereaved Family's Search for Justice". "They want you to, with the best intentions. They want you to find peace or feel better. It's been 11-and-a-half years now and I know myself well enough to know that it's not going to happen." The Cohen's are straightforward when asked why they wrote the book. "It was not written as a personal therapy," says Daniel Cohen. "We are professionals. We have a cause and a point of view and we want to get it out as effectively as we possibly can. It's a personal story, but it was done for reasons that were other than personal." "It's always been our aim to keep the memory of Pan Am 103 alive in this amnesiac country we live in," says Susan Cohen. "It is an absolutely ghastly act of war and war crime and war against humanity. "We wanted not only to remind everybody," Susan Cohen continues, "but tell this story from the inside. We are people in a Hitchcock movie without a happy ending. For us, this is what it's like to be on the inside, to try to survive through this horrible loss." 27/7/2000: Lawyers in the Lockerbie trial reached agreement on a wide swath of evidence Thursday and sharply cut the number of witnesses to testify, in a move that could dramatically shorten the proceedings. In a statement issued late Thursday, prosecutors said they now expected to complete their case by the end of September. The trial, now adjourned, resumes on Aug. 22. The case is being heard by a Scottish court sitting in the Netherlands, a compromise reached after Libya refused for years to hand over the suspects for trial on Scottish soil. Prosecutor Alan Turnbull told the court that some 60 relatives and friends of victims would no longer need to take the stand to give routine evidence on the ownership of items of baggage from the Boeing 747 that crashed at Lockerbie, Scotland, on Dec. 21, 1988, killing 270. Turnbull also said a number of FBI agents would not be required to give evidence. A second body of evidence that the two sides now consider not to be controversial concerns the business interests of several Arabs in Malta and movements of others to and from Scandinavia. The opposing parties have agreed about the import of pasta-making machinery and cutters into Malta, telephone calls made, contact between the individuals and a forged passport found at the house of a man in Sweden. "As a consequence, a number of individuals may be excused" from giving evidence, Turnbull said. Prosecutors say the two Libyans on trial, Abdel Basset Al-Megrahi and Al-Amin Khalifa Fahima, posed as Libyan Arab Airlines employees at Malta's Luqa airport to put a suitcase with stolen transfer tags on a plane bound for Frankfurt, Germany. They say the case passed through an X-ray machine at Frankfurt airport and onto the New York-bound Pan Am Flight 103 before exploding over Lockerbie. Defence lawyers contend the bomb was planted in Frankfurt by Palestinian guerrillas who took advantage of sloppy security there. Turnbull proposed an adjournment and Presiding Judge Lord Sutherland agreed, setting Aug. 22 as the date to resume. Prosecutors will then bring more witnesses to provide evidence about events and airport security in Malta and Frankfurt before moving on to operations at London's Heathrow Airport, the flight's last stop before heading to New York. Defence lawyer Bill Taylor said Tuesday the trial could be drastically shortened by agreements with the prosecution. "The estimate of the length of the case is now one-third," said Taylor, who represents Megrahi. Scottish law provides for the prosecution and defence to agree on items of non-controversial evidence and avoid unnecessarily lengthy cross-examination of witnesses. While the trial is in recess, the court will try to bring to the Netherlands two potential Maltese witnesses who have refused to attend. Turnbull told the court that police in Malta had visited the two, believed to be airport staff, with documentation, but they had refused to accept it. To coincide with the end of the trial, I will be adding several reflections upon the bombing, its verdict in the Netherlands court and how it has impacted people across the world since 1988. No one had more reason to remember the night of Dec. 21, 1988, than Steven Flannigan did. Christmas was only four days away, so Steve, then 14, had slipped next door with a present for his 10-year-old sister, Joanne. It was a new bike, and he wanted to set it up for her. Steven was in the neighbour's garage when one of the jet engines and a chunk of wing from Pan Am Flight 103 slammed into his house on Sherwood Crescent in the Scottish village of Lockerbie. He ran out to see an orange fireball where his three-bedroom home had just been. Where Joanne and his parents, Katherine, 41, and Thomas, 44, had just been. Only parts of Joanne's body were ever recovered - nothing of Steve's parents was. There were plenty of other horrifying sights that night, sights that seared themselves into the collective memory of hundreds of families affected by the Lockerbie tragedy. Halfway up a hill, the fuselage had landed in the backyards of Rosebank Crescent. Bob Edgar ran out to see a baby boy's body snagged in a tree and Maxwell Kerr saw a young girl still belted into her seat, propped against the chimney atop a roof. She was so upright that they thought she might still be alive, until they reached her. Edgar counted 18 bodies in his own backyard, many still in their seats, but the detail that will forever remain in his mind is how most of them had crossed their fingers and died that way. A terrorist bomb had just blown the plane into pieces at 31,000 feet, but in the fuselage most of the 259 aboard survived the remaining 46.5 seconds until impact. Everyone aboard died, along with 11 people on the ground including Steve Flannigan's parents and sister. Certainly no one had more to remember than Flannigan. And no one would try harder to forget. In the dozen years that it took for British and American authorities to find, arrest and try the Libyan terrorist who last week was convicted of one of the 20th centuries worst mass murders, Steve Flannigan grew up trying to put the night behind him. After he and another surviving brother, David, won a $3.2 million settlement from Pan Am, Steve wandered in and out of towns, relationships and jobs. He had an affair with his foster mother and was driven out of town by the scandal. He even tried, of all things, stunt flying. But the trial of Abdelbaset Ali Mohmed al-Megrahi, chief of airline security for the Libyan Intelligence Service, and a Libyan Arab Airlines employee, Al Amin Khalifa Fhimah, had just begun last year when Flannigan became Lockerbie's latest victim, and in many ways its saddest. Worn down by a decade of sleepless nights, Flannigan drank two and a half gallons of beer at a pub on Aug. 17, 2000 and lay down on a railroad track. He was killed by a slow train that announced its approach with a long blast on an air horn. Flannigan was 26, the last surviving member of his immediate family. David died in 1993, reputedly of dope induced heart failure in a cheap hostel in Thailand. 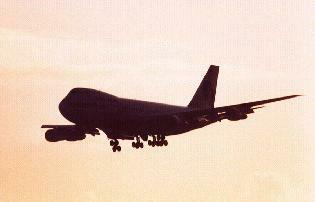 David had left Lockerbie just before Pan Am 103 to live with friends, having fought with his father. But the two then reconciled on the phone, and David was planning to return home for Christmas. Steve's death was the final tragedy in a terribly tragic story, his friend John Boyce said last week. Lockerbie still seems to be claiming victims and generating controversy, seemingly without end. Last week Megrahi was convicted of the 270 murders by a Scottish court sitting in the Netherlands. The trial was a compromise worked out by the United Nations to persuade Libya's leader, Muammar Kaddafi, to turn over the suspects. Four hundred parents lost a child, 46 parents lost their only child, 65 women were widowed, 11 men lost their wives, 140 lost a parent, 7 lost both parents, chief prosecutor Colin Boyd told the panel of judges as they considered sentencing. Megrahi got life in a Scottish jail, with parole possible in 20 years. Fhimah was acquitted and returned to a hero's welcome in Tripoli, where Kaddafi sacrificed a camel for him. Kaddafi vowed that Libya would never accept responsibility for the bombing. Many Pan Am 103 families say Megrahia's conviction is just the first step in establishing that responsibility. This is especially true of the U.S. relatives, who fear that without legal pressure from them, President George W. Bush will join the Europeans and quietly drop sanctions. Megrahi was an intelligence agent, and that points the finger right back at the regime, says Daniel Cohen of Cape May Court House, N.J., whose daughter Theodora was among 35 Syracuse University exchange students who died. The same group of murderous thugs are running Libya now as were back then. Despite its heated rhetoric, Libya has hinted that it will consider paying compensation. Ever since Libya turned over Megrahi and Fhimah for trial, U.N. sanctions have been suspended except for the unilateral U.S. ban on American trade. By last fall Libya was proffering $35 billion in new projects, and Western businessmen were flocking there. The European impulse, says David Mack of the Middle East Institute, will be to close the door on the past and move on. For many American Pan Am 103 families, that is impossible. They still make annual pilgrimages to Lockerbie. Most stay with sympathetic local families. There are always fresh flowers at the four memorials marking where the planes major chunks crashed. Many of the villagers, while hospitable, have begun to think the Americans are carrying the torch too far. They just can't let go of it, says a woman whose own house was destroyed that night. She and her family were out at the time, but they lost everything except their lives. "Its time to just put it behind us, we can't go on whingeing endlessly. Sometimes I feel like telling them, just pull up your socks, wont you?" This woman says she was shocked at one meeting between American and British victims. "The Americans were way over the top, she says. Some of them were saying they should nuke the Libyans. Nuke them, imagine!" As for Steve Flannigan, he, too, had spurned efforts by U.S. support groups to recruit him after the tragedy. He got piles of mail from all the family groups, but they all just sat there unopened, says Boyce, who lived with him in recent years. Village leader Marjory McQueen says she was disappointed when Steve told her he wouldn't attend Lockerbie's 10th anniversary in 1998. "He tried to stay away, I guess because of the memories but he couldn't, he kept coming back." Perhaps because he had to. Jeannine Boulanger, an American nurse who is the emotional-support liaison for Victims of Pan Am Flight 103, says she wonders about the psychology of people like Flannigan who shun support groups like hers. Boulanger, of Shrewsbury, Mass., lost her daughter Nicole, one of the Syracuse students. Boulanger was filmed at JFK airport screaming, "oh my baby, oh my baby" that has been rebroadcast many times. She says the loss was even harder to bear when the cause proved to be terrorism. "People are re-victimised, over and over. Every time there's another development, the nose cone is on the screen. All of a sudden, on an ordinary day, Lockerbie is in the news, and it brings you right back." Adds Boulanger "You have to recognise your grief to cope with it. If you don't deal with it, it's going to raise its ugly head." For Steve Flannigan, the last member of a family destroyed by one terrible night 12 years ago, it finally did. The Lockerbie bombing trial is over. The three judges in the special Scottish Court in Camp Zeist in the Netherlands acquitted one the two Libyan defendants, Lameen Fhima, but Abdelbasset Megrahi was pronounced guilty. The verdict was unanimous. "You are now discharged and free to go. ", Judge Sutherland told Fhima in the courtroom. In the case of Al Megrahi, Lord Sutherland added that the guilty verdict was subject amending the charge. The charge was then amended by the clerk to delete a reference relating to the delivery of the suitcase containing the bomb to Malta but the judges' verdict remains that he was responsible for planting the bomb. Lord Sutherland stated that as Al Megrahi had been convicted of murder that a mandatory life sentence had to be imposed. He said that a minimum of 20 years would have to be served before he could be considered for parole. This 20-year period reflected the fact that the accused would be serving his sentence in a country he regarded as foreign and also considered the age he would be when he was liable for release. He indicated that following the commission of such a horrendous offence a longer minimum period would have otherwise been set. After the verdict, a hush descended on the court, and there were gasps from some of the relatives as Fhimah was declared not guilty. The spokesman of an UK relatives organization, Dr Jim Swire, whose daughter Flora died in the bombing, collapsed in court and was taken away by paramedics. The 64-year-old, from Bromsgrove was helped out by the Reverend John Mosey and other relatives who were in court to hear the verdicts. Sources in the court said an ambulance had taken the Briton to hospital and that Swire turned deathly pale minutes after three judges found Megrahi guilty. Jane Swire later added that she had spoken to her husband and he was not seriously ill. "I have spoken to him and he's okay. I think he got to court without eating anything properly and his blood sugar levels must have been too low. Coupled with the emotion of it all, it's taken its toll." Mrs Swire said they had accepted the verdict and she hoped the families could draw a line under the tragic event. "I am pleased it has come to a conclusion. I am sure there will be an appeal but we will just have to wait and see. I am sure Jim will want to look at other things, which have not been talked about or covered by the trial, such as the failure of airport security. We knew that the trial was not going to cover these sort of things." 06/03/02: If the judges in the Lockerbie appeal in the Netherlands decide next week to let the accused walk free, a 13-year-long worldwide hunt for those who blew up Pan Am Flight 103 over Lockerbie, Scotland, will have failed. Acquitting Abdel Basset al-Megrahi, the Libyan convicted of the December 1988 bombing, would mean no one has been found guilty in the deaths of 270 people. But one man in particular will be delighted. A tireless campaigner against miscarriages of justice, Paul Foot, a veteran author and investigative journalist, says the trial in which Megrahi was convicted and condemned to life in prison was "monstrous," "idiotic" and "utterly corrupt." He says he'll never give up fighting for the verdict to be quashed. "Its monstrous. The whole thing is so absolutely monstrous - they created a case out of absolutely nothing at all," Foot says of the prosecutors in the trial under Scottish law in a Dutch court. Megrahi was convicted in January 2001. Another man, Al-Amin Khalifa Fahima, was acquitted. In 1997, Foot's relentless campaigning helped secure the release of three innocent men jailed for 18 years after they were wrongly convicted of a child killing. This time, his sights are set on the Scottish judiciary that convicted the Libyan of planting a bomb that killed 259 passengers, mostly Britons and Americans, and 11 people on the ground. Foot is convinced the wrong man is in jail, equally convinced that British and U.S. authorities investigating the bombing knew exactly who did do it, and adamant that immense political pressure forced justice into second place. "It was political from start to finish. They knew who did it and they let them off," he told Reuters. "They let them off because of the Gulf War (news - web sites). They needed Syria on board." To set out his case, Foot has published a 30-page special report on the Lockerbie investigation that looks closely at the political backdrop at the time. The report says Libya was never even mentioned as a possible suspect for more than a year after the bombing, since all clues pointed to the Popular Front of the Liberation of Palestine General Command, backed by Iran and Syria. "At that stage (one year on) ... there was not a jot of evidence to incriminate anyone outside the PFLP-GC or their paymasters," Foot writes. "The forensic evidence ... incriminated the PFLP. Police intelligence, top politicians and every journalist who investigated the story came to the same conclusion. There was one set of suspects, the PFLP-GC, and only two countries were implicated, Iran and Syria." He also points out that Iran had an obvious motive for the Lockerbie bombing - revenge for an Iranian passenger plane shot down by an American warship in the Gulf a few months earlier. Foot argues that U.S. President George Bush (senior) and British Prime Minister Margaret Thatcher knew that Palestinian extremists backed by Iran and Syria had carried out the bombing. But with war against Iraq looming, it did not suit them politically to have that made public. "If the U.S. was to go to war in the Gulf, Iran would have -- at the least -- to be neutralized," Foot writes. "More importantly, Arab support had to be found to bolster the U.S.-UN forces preparing to invade Kuwait ... and Syria was the obvious choice." By the start of the Gulf War, both these things had happened. As a result, Foot says, all public talk of the PFLP-GC connection with the Lockerbie bombing suddenly disappeared from 1990, and slowly but surely, Libya began to be touted around as a likely suspect. Ten years later, it was Libya, not Syria or Iran, that was in the dock at the Lockerbie trial at the special Camp Zeist court in the Netherlands. Some may dismiss Foot's report as a grand conspiracy theory - or even a grand coalition of conspiracy theories. But his central view, that the Camp Zeist trial verdict that convicted Megrahi was wrong, is one supported by some well placed and high-profile experts. The lawyers and legal consultants that came together to appeal for Megrahi included Harvard law professor Alan Dershowitz who helped defend O.J. Simpson, Plato Cacheris, who represented Monica Lewinsky, Clive Nicholls, who represented Augusto Pinochet in Britain, and Frank Rubino, who has acted for former Panamanian strongman Gen. Manuel Antonio Noriega. Rubino said after Megrahi's conviction he was sure the judges were not in control, but U.S. authorities were. "Sometimes judges feel they have an obligation to convict," he told a Scottish newspaper. "The verdict ... is not supported by the evidence. From my studies of the trial, I feel it facilitated the U.S. government's control of the case." A U.N. observer who monitored every moment of the court case - which ran from May 5, 2000, until Jan. 31, 2001 - was blunt in his assessment. "The air of international power politics is present in the whole verdict of the panel of judges," Dr. Hans Koechler wrote in his report of the trial. "There is not one single piece of evidence linking the two accused to the crime," he said. "The opinion of the court is exclusively based on circumstantial evidence and on a series of highly problematic inferences." For Foot, the appeal on which a panel of five new judges is expected to rule on March 14 is a chance for the justice system as a whole to demonstrate its independence and stand up against the power of political pressure. But despite what he and others see as a plethora of reasons why they must do so, Foot does not believe the judges will have the guts to let Megrahi walk free. "My instinct is no, they won't let him off," Foot says. "If they do I will rejoice. But if they don't, I will go on hammering away at them. This is something these judges will have to live with for the rest of their lives." 11/03/02: Freedom, further legal wrangling or incarceration in a tough Glasgow jail? On Thursday, appeals judges will decide the fate of the Libyan convicted for the 1988 Lockerbie bombing. Abdel Basset al-Megrahi, 49, could walk free from the special Scottish court in the Netherlands if the five-judge panel quashes his guilty verdict as a miscarriage of justice. But if they uphold the January 2001 conviction for Britain's bloodiest mass murder, the former Libyan intelligence agent has one last ray of hope. Megrahi, found guilty of planting the bomb on a New York-bound Pan Am jumbo jet that exploded and killed 270 mostly Americans could ask the United Kingdom's final appeal body, the Privy Council, to look at his case. If he accepts a final guilty judgement, however, he would spend much of the rest of his life in Glasgow's notorious 19th-century Barlinnie prison, Scotland's largest jail. Released inmates from the Gothic gray granite building, which had a reputation for Victorian brutality, say a special cell has been built for Megrahi, dubbed "Gaddafi's cafe" after Libyan leader Muammar Gaddafi. The three trial judges in January 2001 gave him the life sentence mandatory for murder under Scottish law, saying he should serve at least 20 years. Megrahi's Libyan co-accused, Al-Amin Khalifa Fahima, was acquitted. The appeal, which ended on February 14, focused on two areas crucial to the conviction: where the bomb was originally loaded and evidence from a Maltese shopowner who said he sold Megrahi clothes found wrapped round the suitcase bomb. Megrahi's lawyers took a two-pronged approach: arguing that the trial judges ignored contradictions in the circumstantial case and could not see the whole picture due to new evidence. During 14 days of hearings earlier this year, the appeal heard testimony from six new witnesses. Defense lawyers argued new evidence of a break-in at London's Heathrow airport on the eve of the mid-air bombing showed the bomb was more likely to have been slipped aboard the doomed jet in London than in Malta as the trial judges accepted. Prosecutors, however, branded the new evidence as "flawed and weak" saying an airport baggage worker eager to go home probably broke open a security door at Heathrow. Legal expert John Grant of Glasgow University's Lockerbie Trial Briefing Unit said appeal judges need overwhelming evidence of a miscarriage of justice to overturn a verdict. "There is a real difficulty for the appeal court if it wants to overturn. It has to have very strong grounds," he said. The appeal panel cannot reject evidence or make a reassessment of the whole case. It can only examine inferences the original judges drew from the facts. Although Megrahi could ask the Privy Council to re-examine the case if his appeal is rejected, the appeal would have to be based on the European Convention of Human Rights. "The problem is that Megrahi's lawyers never flagged up any human rights points (up to now). The only thing you could say is that the trial was unfair, but they have never alleged that," Grant said. A complete retrial is also possible, in theory. Before the hearings were adjourned in February, presiding Judge Lord Cullen discussed with lawyers the possibility of a retrial if the original judgement was overturned. But legal experts said this was very unlikely, considering the logistics. The appeals court will issue its ruling at a specially created Scottish court in Camp Zeist, a former U.S. air base in the central Netherlands picked to allay Libyan objections to a trial in Britain. 14/03/02: Families of the Lockerbie airliner victims insist that their quest for justice was not over despite the decision by appeals judges to uphold a murder conviction against the Libyan bomber. Bereaved relatives from Britain repeated their call for a full public inquiry while several from the United States demanded action by their government as part of its war on terrorism. "It's not the end of the road by a long way," said Jean Berkley, a Briton whose son Alistair was on Pan Am Flight 103 when it exploded over Lockerbie, Scotland, on December 21, 1988 and claimed 270 lives. Scottish appeals judges at a specially-created court in the Netherlands announced on Thursday that they had upheld the conviction of Abdel Basset al-Megrahi, a former Libyan agent. He was sentenced to life in January 2001 for blowing up the New York-bound Pan Am jet. The original trial acquitted Libyan co-accused Al-Amin Khalifa Fahima. U.S. officials have promised that leads in the Lockerbie case will continue to be pursued, said Kathleen Flynn, an American whose 21-year-old son died in the crash. "If there is a trail of evidence that comes out...we will follow it," she told reporters. "After the September 11 suicide airliner attacks in the U.S.A everyone in the world is cognizant of the importance of dealing directly and swiftly with terrorism," Flynn added. American Larry Fisher said the United States should take consider taking action against Libya. "The question remains for the U.S. government with our newly established policy of zero tolerance against terrorism, what this means for Libya," he said. "We need to reach back 13 years and apply it to this event." The son of Libyan leader Muammar Gaddafi said last month the Libyan government would pay compensation to the families of the Lockerbie victims. The UK Families Association, which has long demanded a public, independent inquiry into Lockerbie, would meet this weekend to decide their next move, Berkley said. Evidence of security lapses at London's Heathrow airport revealed during the trial made a public inquiry vital for the future of aviation security, said Jim Swire, a British doctor who has been crusading for justice since losing his daughter Flora in the Lockerbie blast. "This is not a time for celebration. It is a time to gather our forces to ensure this never happens again," he said. "We are not a group that has been after vengeance, but only truth and justice." Peter Lowenstein, an American who lost his son Alexander in the disaster, expressed relief and said many relatives had feared the conviction might be overturned. "It was very tense (before the judgement)," he said. "Now, there's a tremendous sense of relief...justice was done." But some relatives said that though the end of legal proceedings gave them some satisfaction, the tragedy would continue to haunt them. "I don't think many of us will ever have closure. We lost our whole lives, we lost our children, our grandchildren," said Glenn Johnson, whose daughter died. "I have a feeling that we may never find out who ordered it." 16/06/02: A delegation of lawmakers from Libya Sunday visited the man jailed for the bombing of Pan Am Flight 103 as his wife spoke of her plans to move to Scotland. The seven-strong delegation made no comment after meeting Abdel Basset Ali al-Megrahi at Glasgow's Barlinnie jail. British government lawmaker Tam Dalyell, said the Libyan group traveled to Britain a day early to visit al-Megrahi before beginning an official visit on Monday during which they were to meet Foreign Office officials and tour Parliament. Al-Megrahi, a former Libyan intelligence agent, was convicted last year of murder over the bombing of the Pan Am flight and sentenced to life in prison with no possibility of parole for 20 years. A second Libyan was acquitted over the bombing which killed a total of 270 people, 189 of whom were Americans, when the plane exploded over the Scottish town of Lockerbie. In March, al-Megrahi lost an appeal against his conviction. He is kept in a cell on his own within the prison. Al-Megrahi's wife, Aisha, said she was planning to move her family to Scotland from their home in Tripoli to be near her husband. "Moving will be difficult. It is a different culture and a different language in Scotland. We will have no family here and no friends," she told the Scottish Mail on Sunday newspaper. "The children had nothing to do with Lockerbie but they are paying the price for a politically motivated decision." She said her husband was in "good spirits" after meeting former South African President Nelson Mandela for more than an hour earlier this month. Mandela, who played a crucial role in persuading Libyan leader Moammar Gadhafi to hand over the two men suspected of involvement in the bombing, said al-Megrahi endures unfair treatment at the prison because he is held in isolation and has nobody to speak Arabic with. The Libyan delegation, led by Suleiman Sasi Al-Shahoumi, the foreign affairs secretary in the General People's Congress, was due to meet Foreign Office ministers as well as lawmakers from all British political parties. The group will also attend sessions of parliament this week. 02/11/02: The Libyan government has taken a major step toward agreeing to pay $2.7 billion to the families of the 270 people killed in the 1988 bombing of Pan Am Flight 103 over Lockerbie, Scotland, according to lawyers for Libya and the families. The proposed settlement agreement, filed this week in U.S. District Court in Central Islip, is contingent on several factors, including the United Nations and the United States lifting sanctions imposed on Libya, and the United States removing Libya from its list of nations that sponsor terrorism. "This agreement is intended to be comprehensive and ... based on payment of compensatory death damages ... in the total sum of up to $10 million for each of the 270 deaths," said the agreement, signed Oct. 23 in Paris by lawyers for Libya and the families. Families of some of the victims, however, reacted skeptically to reports that a settlement may be close. A key factor is whether the Libyan government admits it was responsible for the bombing, said Bert Ammerman, former president of the Victims of Pan Am Flight 103, whose brother Tom, 36, was killed on Flight 103. "If Libya doesn't accept responsibility, this will never be accepted. "That's a critical component," said Ammerman, of Rivervale, N.J. A senior U.S. State Department official yesterday also expressed a similar concern. "We welcome any progress with the families that can be made on compensation, but Libya has to meet all the requirements of the United Nations, including accepting responsibility," the official said. Ammerman said his understanding was that lawyers for the families wanted the approval of at least 80 percent of the next of kin. Libyan agents were accused of planting the bomb, and one Libyan intelligence officer was convicted in the bombing and is serving a life sentence in Glasgow. Also complicating the agreement were plans by several lawyers, who said they represent some of the survivors' families, who want to institute their own suits on behalf of their clients. U.S. District Court Judge Thomas Platt, however, stayed further motions in the case Friday for a year, granting the Libyans, the United States and the United Nations time to work out agreements in line with the proposed settlement, according to Robert Mirone, a Manhattan attorney who represents the Libyan government. Lee Kreindler, one of the attorneys appointed by the court to represent the interests of all the victims' families, called Friday's court action "an important step" in concluding court actions in the bombing case. Mirone, the lawyer for Libya, agreed, noting that the Libyan government has agreed "to voluntarily accept the rulings of U.S. Courts." 14/12/2002: A student, attending an American university as part of an exchange programme in memory of the Lockerbie bomb victims, has died after falling from a seventh floor window. Andrew McClune, 18, who was at Syracuse University, New York, was found in the early hours of yesterday morning with severe injuries. He was taken to the University Hospital, but was pronounced dead two hours later. The teenager was one of two students who won the scholarship set up in the wake of the 1988 terrorist bombing which killed 270 people, including 35 Syracuse students. Andrew was named head boy at Lockerbie Academy during his final term at the school this year. He had decided not to return to Scotland for the festive season, preferring instead to stay in the US. One of Mr McClune�s friends in the farming town said: "Andrew was enjoying himself so much out there he had decided not to come home for Christmas." Details of how the accident occurred remained unclear last night, but officers from Syracuse Police Department said there were no suspicious circumstances. In Lockerbie, Mr McClune�s family were said to be too upset to discuss their loss. 30/04/2003: The British government and families of victims of Pan Am Flight 103 responded cautiously Wednesday to Libya's claims that it has accepted "civil responsibility" for the 1988 explosion over Lockerbie, Scotland, and is willing to pay $2.7 billion in compensation. Libya's Foreign Minister Abdel-Rahman Shalqam told The Associated Press on Tuesday that the families of each of the 270 victims will receive $10 million in three installments in return for the lifting of U.N. and U.S. sanctions and Washington's removal of Libya from its list of states sponsoring terrorism. A spokesman for the families of many British victims said they had heard nothing new from their lawyers regarding the compensation deal. "Actions speak louder than words, and we will believe this when the arrangements have been confirmed with the lawyers, when the first payment has been received and the checks have cleared through the bank accounts," spokesman David Ben-Aryeah said. In the United States, a man whose daughter died in the explosion also reacted cautiously. "Until I get official notification or we get official notification from our government and legal team, we consider this as more news that's not confirmed," said Robert Hunt of Webster, N.Y. His 20-year-old daughter, Karen Hunt, was one of the 35 Syracuse University students killed in the bombing. An American woman who lost her son expressed skepticism about the announcement. "I'll believe it when I see it. This has gone on for two years and we've heard the same story for two years," said Doris Cory, of Shrewsbury, Mass. Her son was also a Syracuse University student. Britain's Foreign Office said it has received no official confirmation of Libya's offer. Foreign Office Minister Mike O'Brien said that while ongoing talks appeared to be "drawing toward a conclusion," there were still details to be agreed. "I think that may be possible, but we have still got some final discussions to have with them, so I think we need to be a little bit cautious at this stage," he said. According to U.N. resolutions, Libya must acknowledge responsibility for the Dec. 21, 1988, explosion, pay fair compensation, renounce terrorism and disclose all it knows of the explosion. It was not clear whether Shalqam's announcement that Libya will "bear the civil responsibility for the actions of its employees" would suffice for acknowledging responsibility. A U.N. Security Council resolution passed in 1992 banned arms sales and air links to Libya in an effort to force it to hand over two Libyans indicted in the Pan Am bombing. After the men were handed over in 1999, the sanctions were suspended but not lifted. In 2001, a Scottish court convicted Libyan intelligence agent Abdel Basset Ali al-Megrahi of the bombing and sentenced him to life imprisonment. Libya surrendered al-Megrahi over for trial after lengthy negotiations. A second Libyan was acquitted. 02/08/2003: The families of the Lockerbie victims have expressed fears that any compensation settlement could be held up by arguments over the amount of commission lawyers stand to gain. The lawyer who represents the majority of the families of the 270 victims affected by the bombing over Scotland in 1988 has revealed that a settlement over the disaster is closer than ever. Jim Kreindler, a New York-based lawyer, said technical issues would be settled "in a matter of weeks, not months". But The Scotsman has learned that a number of issues, particularly concerns about the distribution of payments and the financial cut for lawyers, could still hamper the progress. A number of relatives are believed to be keen for a second opinion on the terms of the settlement, particularly over fears the individual families must give up their legal right to sue the Libyan convicted of the bombing before they actually receive any money. Another legal battle concerning the fees incurred on this one could result. One US relative, whose teenage daughter died, said that even if a deal is reached it could still be years before they see any compensation. She said: "The settlement presently drafted would have the relatives give up irrevocably all their claims against the Libyan defendants and have their lawsuits dismissed with prejudice. But this happens when money is paid to an escrow [trust] account controlled by a committee of lawyers, not when the money is paid directly to the families. "From this account, the issue of legal fees and handling fees for the escrow account come into play, and that could tie things up in a lot of red tape. "The families are giving up their right too long before they will physically receive any money. "In my view, this document should only be signed after the most careful review, and preferably by getting a second legal opinion from a lawyer experienced in such matters who is not involved in this case and whose fee is not dependent on this settlement." She added: "Even if an agreement is reached, this could still go on for years." She stressed money was not the key issue to most families, and that a statement from Libya admitting responsibility for the bombing would probably not be published before the settlement. She said: "The Libyan Statement of Responsibility has not been released and we dont know when we will see it, so there is no way for the relatives of the victims to judge whether it is satisfactory to them or if it is likely to be satisfactory to the UN Security Council and the US government. "We probably wont know this until well after we have signed everything away and our claims against Libya are given up. This is a real danger. We need the Libyans, or whoever did this, to apologise and accept the blame." It is widely believed that US lawyers acting for the families of the victims will earn more than £500 million in commission if the settlement with Libya goes ahead. The US firms defended the deal, which will see them take about 30 per cent of the pay-out to each family. But the Scottish law firms who have helped to co-ordinate the compensation fight for many of the British families insisted they would receive only an administration fee for their efforts. The huge legal fees are the result of the high-risk "no win, no fee" deals the majority of the families signed with a number of top US legal firms based in New York. Most of the British victims are represented by the Manhattan legal firm Speizer Crowse, which is understood to have the relatives of 30-plus UK victims signed up to contingency deals securing lawyers between 28 and 35 per cent of any individual settlements. Speizer Crowse, one of the most highly regarded legal firms in the US, currently represents 60 families seeking compensation, while its rival, Kreindler & Kreindler, represents 118, mainly Americans. Last night, a source close to the British families seeking compensation also admitted that the issue was far from resolved. He said: "The time taken to agree and set up the machinery by which relatives of the victims may receive some form of compensation has taken an unconscionably long time. If the precedent set by the civil case against Pan Am continues, the lawyers will take the lions share of the money. "A lot of people have the impression that each family will get $6 million, but the reality is they will only receive a fraction of this." 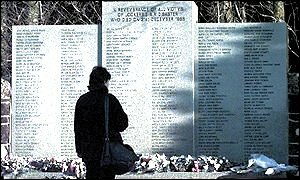 14/08/2003: Relatives of British victims of the 1988 Pan Am bombing over Scotland say they would rather have an independent inquiry into how the attack happened than money from Libya. British families who lost loved ones in the Pan Am bombing say they have mixed feelings about an offer from Libya to pay $10 million compensation per victim, in exchange for an end to international economic sanctions. The father of one of the British victims is the Reverend John Mosey. His 19-year-old daughter, Helga, was one of the passengers on the airliner, which blew up over Lockerbie, Scotland, on December 21, 1988. Reverend Mosey says the compensation agreement is a distraction from the families' quest for an investigation into alleged security failures that allowed the bombing to happen. He told British radio Thursday there are a number of questions he wants answered. "How, in the face of at least 10 very specific warnings - many of them, nothing was done to protect us? How is it that notices were put on American Embassy notice boards advising people that they ought perhaps not to fly with Pan Am at that time? No one told us," he said. "We need to have an independent inquiry into all these things." Lawyers for victims' families say they signed a deal with Libyan officials in London Wednesday to set up a $2.7 billion dollar compensation account. The deal requires Libya to send a letter to the U.N. Security Council accepting responsibility for the bombing, which killed 270 people. Libya also must renounce terrorism and pledge cooperation with any further investigations. That could clear the way for the Security Council to lift economic sanctions that have been in effect since 1992. However, there were signals from Paris Thursday that France might block the settlement. The French Foreign Ministry said that, before sanctions end, Libya should also compensate relatives of the 170 people who died in the 1989 bombing of a French UTA airliner over Niger. In Washington, the U.S. State Department plans on Friday to consult about the agreement with the families of American victims. U.S. officials say the United States will accept the deal, if the families agree to it. However, it is not clear if the United States will end its own sanctions against Libya, or remove the North African country from its list of state sponsors of terrorism. 14/08/2003: Libya and lawyers for families of the 1988 Pan Am 103 bombing victims have signed an agreement to set up a $2.7 billion compensation account. The lawyers say they and Libyan officials signed the deal Wednesday in London. Under the arrangement, Libya is now required to send a letter to the U.N. Security Council taking responsibility for the bombing over Lockerbie, Scotland that killed 270 people. The deal also calls for Libyan officials to renounce terrorism and agree to cooperate with any further Lockerbie investigation. If Libya fulfills the terms, the U.N. Security Council will vote to lift economic sanctions imposed in 1992. It is not yet clear if or when the United States will consider ending its own separate sanctions against Libya or remove it from the list of state sponsors of terrorism. Wednesday's signing comes a day after Libya agreed to the terms of a deal with the United States and Britain to take responsibility for the bombing. A U.S. State Department official told VOA that if the families accepted the Libyan deal, it would also be acceptable to the Bush administration. 14/08/2003: The Libyan government signed an agreement yesterday setting up a $2.7 billion fund for families of the 270 victims of the 1988 Pan Am Flight 103 bombing - a key step to lifting U.N. sanctions against Libya, according to an e-mail from the families' lawyers. The agreement setting up an escrow account at the Bank for International Settlements was reached after an 11-hour session in London, said the e-mail signed by attorneys James P. Kreindler and Steven R. Pounian and read to the Associated Press. The bank, which has its headquarters in Basel, Switzerland, and is known as the BIS, confirmed earlier yesterday that it was asked to manage an escrow account "from which claimants will be compensated." Libya will pay up to $10 million for each victim, lawyers have said. Under the deal, U.N. diplomats said, the Libyan government would start transferring the $2.7 billion into the escrow account immediately and complete the transaction today. The Libyan government then would send a letter to the Security Council saying it met the conditions for lifting sanctions - by taking responsibility for the bombing, renouncing terrorism and paying compensation to the families, the diplomats said. The United States and Britain also would send letters to the council saying they believe Libya has met the requirements to have sanctions lifted, and Britain would circulate a draft resolution doing so, the diplomats said. Tomorrow is the target date for sending the letters, circulating the draft resolution and holding a meeting at the State Department with victims' families, the diplomats said. Susan Cohen, of Cape May Court House, N.J., whose daughter, Theodora, 20, died in the bombing, also said the State Department called her to say victims' families were invited there tomorrow. The compensation deal calls for Libya to pay each victim's family $4 million when U.N. sanctions against Libya are lifted, another $4 million when the United States lifts its own sanctions against the country, and $2 million when Libya is removed from the State Department's list of countries sponsoring terrorism, said Mark Zaid, an attorney representing more than 50 relatives of victims. Initial $4 million payments will be made to a New York trust account after the Security Council resolution lifting the sanctions is entered, Kreindler and Pounian said in their e-mail to family members. While the attorneys appeared confident that sanctions would be lifted quickly, U.N. diplomats were not so sure. That's because Col. Muammar el Kadafi's government agreed in 1999 to pay only $33 million to families of the 170 people killed in the 1989 bombing of a French passenger jet over Niger. Six Libyans, including Kadafi's brother-in-law, were convicted in absentia by a French court in March 1999 of bombing the UTA flight and sentenced to life in prison. The $33 million Libyan payout for the UTA bombing would provide just $194,000 for each of the 170 victims - a point stressed by French diplomats. While Paris is not expecting the same deal the Pan Am victims are getting, diplomats said France wants equity for the UTA victims. Also, a U.S. official in Washington said the Bush administration, skeptical about lifting the U.N. sanctions, was weighing whether to abstain or support the British-drafted resolution. The official spoke on condition of anonymity. A Security Council resolution passed in 1992 banned arms sales and air links to Libya to try to force Kadafi's government to hand over two Libyans indicted for the Pan Am bombing over Lockerbie, Scotland. After the men were surrendered for trial in April 1999, the council suspended sanctions indefinitely. In 2001, a Scottish court convicted Libyan intelligence agent Abdel Basset Ali al-Megrahi of the bombing and sentenced him to life imprisonment. A second Libyan was acquitted. Under the U.N. resolution, sanctions cannot be lifted permanently until Libya acknowledges responsibility for the bombing, pays fair compensation, renounces terrorism and discloses all it knows about the explosion. 14/08/2003: The US State Department has reached a deal with Libya to compensate victims of terror -- and it has invited the relatives of the 1988 Pan Am bombing victims to Washington to discuss the settlement. Under the agreement, Libya will take "civil responsibility" for the bombing and pay $2.7 billion to the victims' families when US sanctions are lifted. Compensation would be cut in half, though, if the US fails to end sanctions against Libya and does not remove it from the list of nations supporting terrorism. The compensation deal calls for Libya to pay each victim's family $4 million when U.N. sanctions against Libya are lifted, another $4 million when the U.S. sanctions are ended, and $2 million when Libya is removed from the State Department's terror list, said Mark Zaid, an attorney representing more than 50 relatives of victims. Foreign Minister Abdel-Rahman Shalqam confirmed the details and said that if the United States does not lift its sanctions and remove Libya from the list, each family will receive $1 million in the second and third stages, giving each family a total of $5 million. "We have accepted this only after we got the necessary guarantees from the other parties," Shalqam said. Glen Johnson of Hempfield, whose daughter Beth Ann, 21, was among the 270 vicitms of Pan Am Flight 103, says his family will accept the settlement; but some others say they won't. Daniel Cohen of New Jersey calls the agreement a "tawdry payoff." Cohen, whose daughter died in the 1988 bombing, says money isn't the issue. "This is supposed to be about justice, it's supposed to be about punishment. It is not supposed to be about blood money and a tawdry payoff and that's all I'm afraid we're going to get out of this," he said. A U.S. official in Washington, speaking on condition of anonymity, said the Bush administration was uncertain about lifting the sanctions and was weighing whether to abstain or support the British-drafted resolution. 24-09-2003: The Lockerbie bomber has lodged a fresh appeal against his conviction for the murder of 270 people in the 1988 atrocity. The Scottish Criminal Cases Review Commission has been asked to investigate the case of Abdelbaset Al Megrahi, who was jailed for the bombing in 2001. The commission is an independent body charged with investigating possible miscarriages of justice. It received an application from solicitors acting on behalf of Megrahi, requesting that it review his conviction. Libyan secret agent Megrahi was sentenced to life in jail in 2001 for the bombing of Pan Am Flight 103, which exploded over the Scottish town of Lockerbie in December 1988. He has been held in a special unit in Barlinnie Prison in Glasgow since March 2002 when his appeal against conviction was thrown out by a special Scottish court sitting at a former airbase in the Netherlands. The appeal comes just weeks after the United Nations Security Council voted to lift more than a decade of sanctions against Libya. It followed Libya's acceptance of responsibility for the Lockerbie bombing and its agreement to pay up to $10m to each of the families of the victims. Al Megrahi's solicitor, Eddie MacKechnie, said there was new evidence never mentioned before included in the team's case, but he refused to give details. "I do not consider it to be appropriate to publicise, in advance of the Commission's deliberations, any precise details of the case now presented," he said. "All I can say is that the case contains detailed legal arguments not previously presented, including allegations of unfairness, abuse of process, insufficiency of evidence, errors in law, non-disclosure of evidence and defective representation." Mr MacKechnie said: "In addition, there is new information and potential new evidence never revealed before supporting Mr Megrahi's consistent plea of innocence and, in certain respects, pointing the finger of blame at those most likely to bear responsibility for the most dreadful mass murder in British history."